With a stay at Perfect Stay in Cluj-Napoca (Cluj-Napoca City Centre), you'll be steps from National Theatre and Avram Iancu Square. 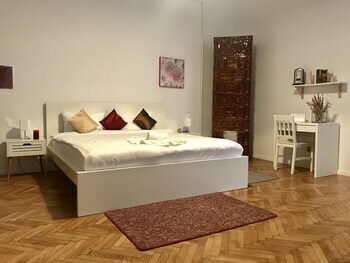 This 4-star apartment is 0.3 mi (0.6 km) from Dormition of the Theotokos Cathedral and 0.4 mi (0.6 km) from Palace of Justice. Make yourself at home in one of the 2 individually decorated guestrooms, featuring refrigerators and microwaves. Your pillowtop bed comes with premium bedding, and all rooms are furnished with sofa beds. Flat-screen televisions with cable programming provide entertainment, while complimentary wireless Internet access keeps you connected. Private bathrooms with showers feature complimentary toiletries and hair dryers.